Hello Friends, Do U want to close your friends/enemies Whatsapp account ? 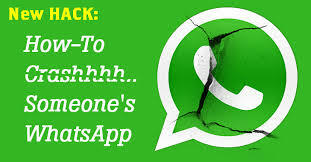 you can now crash any Whatsapp messenger account easily... Dont know is it possible in whatsapp web . *.Now Install It And Open, Signup Your Bluestacks Account. *.Now Create New Whatsapp Account With New Mobile Number . *.Now Refresh Your Whatsapp contacts, and add the victim in Whatsapp. *.Create New Message With 3000 Smiley's in Whatsapp and send it. *.For type 3000 Smiley's faster, just type 20 Smiley's and select all by Ctrl+a and paste in under 20 Smiley's. *.now again copy the whole smileys and paste it on chatbox. follow it again and again. *.Only Try with above whatsapp plus mod,otherwise when you crossing at typing 1500-2000 smileys, your Whatsapp gonna hang. *.so, only try with above whatsapp plus mod. *.this method is absolutely 100% working fine..
don't use it for illegal Purposes.